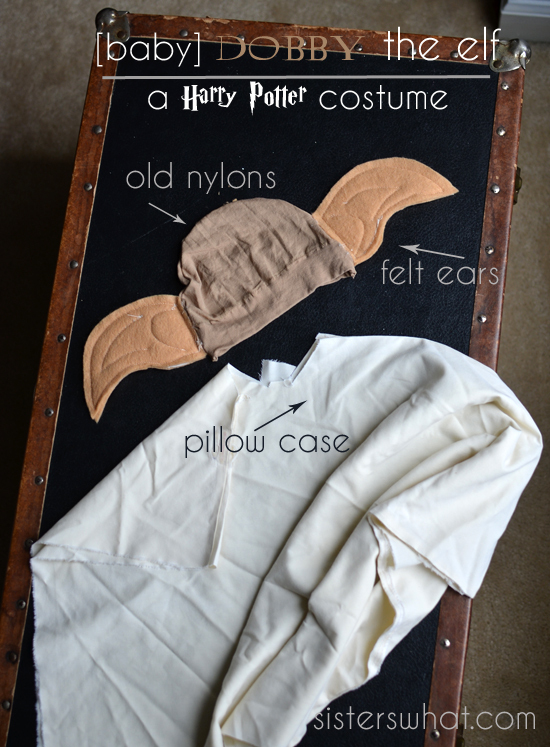 ' DIY Dobby the House Elf baby costume, a Harry Potter Costume - Sisters, What! *this post may contain affiliate links, thanks for supporting our blog! 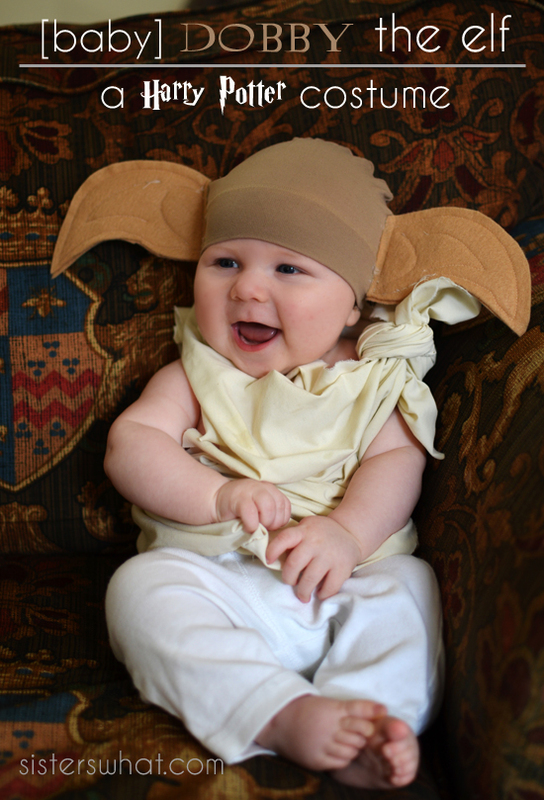 For last Halloween, baby sweet cheeks was Dobby the house elf. He was only 4 months old and he made the cutest little elf. Seriously, just look at that smile. || I then sewed them together with ear contour lines in the middle. || I then measured my baby's head. Then I took the waist part of some old nylons and cut two half circles from the nylons (see below). || Take your bottom piece of your hat and lay it down right side up. 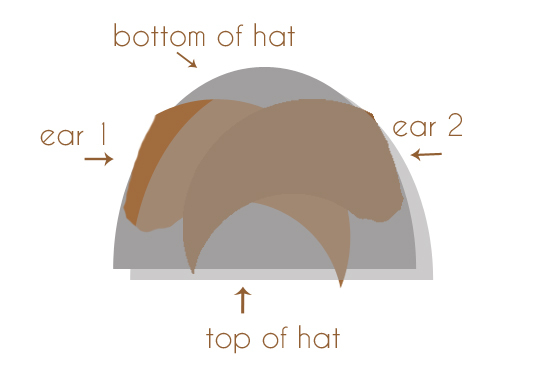 Then place your ears inside of the hat so the edge of the inner part of the ear is touching the edge of hat. Then place on top of ears the top part of hat, right side touching the ears. Then sew around edges except the bottom. And your done! And seriously, have you ever seen a cuter Dobby? Thanks! He is so darling. I am currently reading the first Harry Potter to my girls, ages 4 and 6. I see a Harry Potter wand in their future. 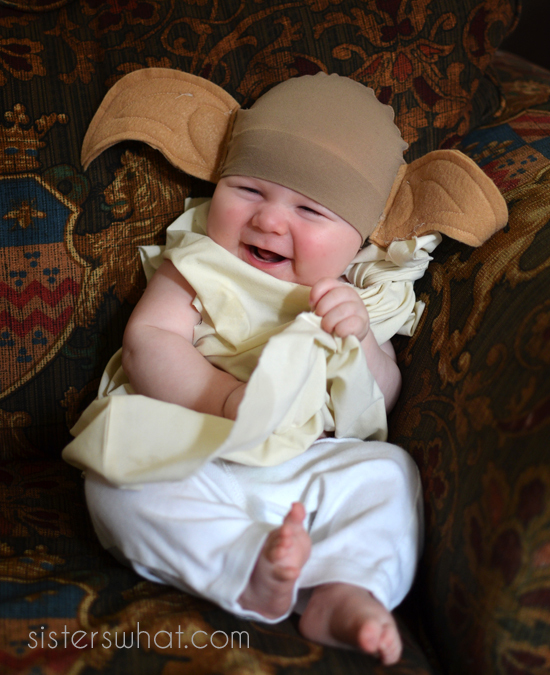 Too bad I didn't think of Dobby when they were babies. I can't wait to read them to my little boys. My 3 year old has seen the first movie and already loves it, but he still is a little to young to appreciate me reading to him. Babies are the best; they don't care what we dress them as.